Newly released Bureau of Labor Statistics data on union membership trends show that union membership as a share of overall employment held steady at 10.7 percent in 2017, with essentially stable membership rates in both the private (6.4 or 6.5 percent) and public (34.4 percent) sectors. Union membership gains among men offset continued losses among women last year. But, it is important to view these different trends by gender within historical context: union membership in 2017 was roughly equivalent among men (11.4 percent) as women (10.0 percent), compared to 1979 when men were more than twice as likely as women to be union members and comprised 69 percent of union members. 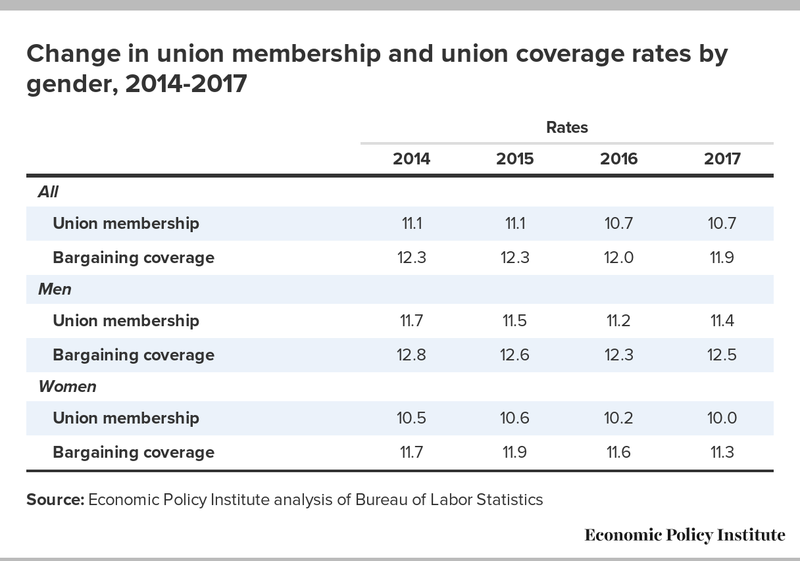 It is difficult to use one year changes in union membership trends to assess underlying dynamics. For one, the small samples involved for particular subgroups produce year-to-year volatility that should not be mistaken for a trend. Second, any change in union density can result from many different factors including the pattern of overall employment growth (whether sectors or occupations that are more heavily union grow faster or slower than average), the success or failure of union organizing drives, the scale of union organizing, changes in workers’ desire for union membership (i.e., demand for collective bargaining), and other factors. An understanding of the dynamics of union membership and representation requires a long-term analysis of detailed trends. Union membership (according to the BLS release) rose by 262,000 in 2017, more than the 173,000 additional workers covered by a collective bargaining agreement (hereafter referred to as “coverage”). See Table 1 (which relies on tabulations of the underlying survey data because BLS does not provide gender breakdowns within sectors). 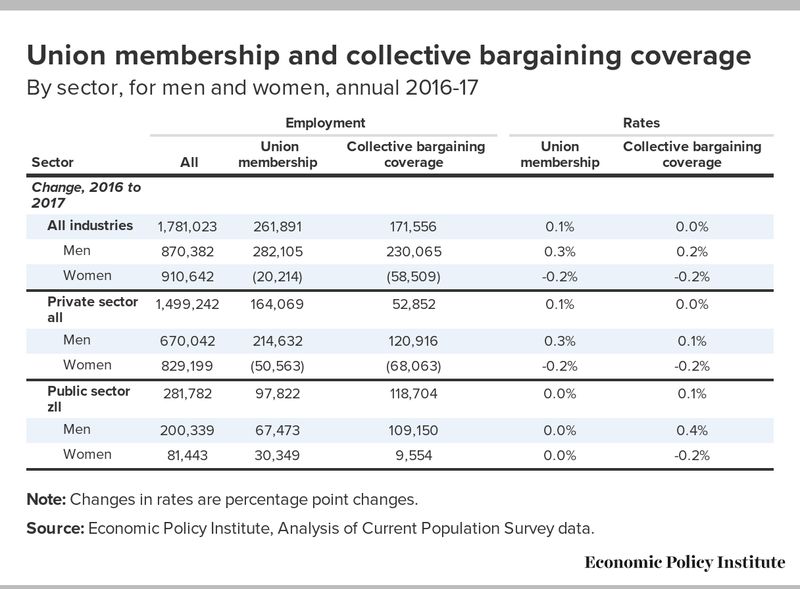 The greater growth in union membership than coverage was driven by developments in the private sector where membership growth was triple (164,000) that of the growth of coverage (53,000), centered in professional and service occupations. Note: Changes in rates are percentage point changes. Source: Economic Policy Institute, Analysis of Current Population Survey data.